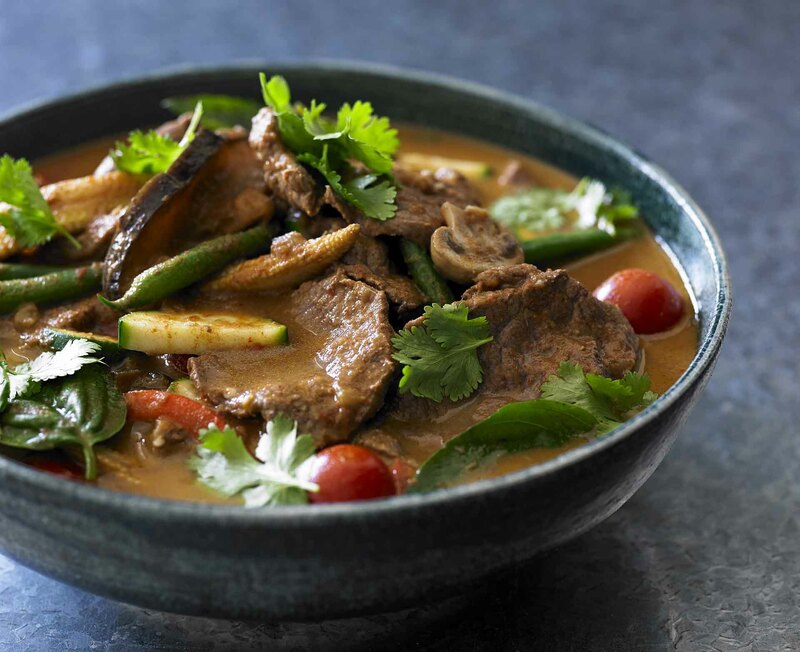 Adam Liaw shares a simple curry, full of zesty Asian flavours. 1. Heat the oil in a large pot and fry the curry paste for a few minutes, stirring occasionally until the paste is very fragrant. Add about 100 ml of the coconut cream and continue to fry for a further 5 minutes. Add the stock or water and bring to the boil. Add the fish sauce, sugar and lime leaves. Boil for 5-10 minutes until the top of the liquid starts to take on an oily shine. 2. Add the vegetables and return to a simmer. Simmer for 5 minutes until the vegetables begin to soften, and add the beef and simmer for a further 10 minutes until the beef is cooked through. Stir through the remaining coconut cream, then stir through the basil leaves and lime juice. Scatter with coriander and serve with steamed rice. Try more delicious recipes from AYAM. Images courtesy of Hachette Publishing.